Mount Hotham is a great mountain, with high spurs radiating off to link up with some of the nicest mountains in this part of the state: The Twins, Razorback, Mt Loch and out towards Cobungra across Higginbotham and a long range of snow gum forests. It has been given over to an alpine resort, with all the impacts that come with that: roads, tows, towers, ski runs, housing, a huge recycled water dam for making snow, etc. Yet the summit can be a surprisingly peaceful place to wander, even in peak season – summer or winter. The following are some suggestions of things to do. Mt Hotham sits in the middle of fantastic alpine country. And hordes of people are drawn to these mountains, making even the back country a busy place in peak tourist season. If you’re up for an alpine walk, want to get away from the really busy trails like the Razorback, and don’t mind the background noise of cars and lots of motorbikes, then the walk from Mt Hotham to either the big carpark on the Hotham side of the CRB Hills, or the Wangaratta ski club, just near the junction with the road to Dargo, makes for a great days outing. You can do this as a long return trip, or get a friend to collect you at the other end (or if you have 2 cars, leave one at either end). Allow around 3.5 hours each way. The walk is a full days outing if you walk both ways, so the normal food, waterproof and warm clothing and water are required. It is rare to find drinkable water along the way. Most of this walk is above treeline and exposed to any weather coming from the south west. It has a lot of climbs and descents and is mostly only on very vague trails so unless you know the country, don’t attempt it in poor visibility (on the other hand it is never more than 5 or 600 metres from the Great Alpine Road, so you can bail if you need to). 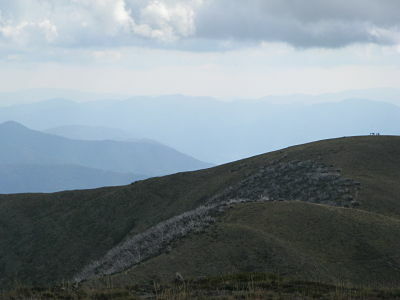 Start in Hotham Central and walk up the summit run, continuing on to the summit of the mountain. At the fire tower and cairn, look for the track markers heading roughly south west. Follow the faint trail down until you get to a thin band of trees, where the track tends to get vaguer. This section is especially nice – this patch of snow gums was not burnt in the fires of 2003 and they are wind trimmed, at the absolute upper limit of their range, barely 10 feet high. Drop down through the belt of trees and into the open beyond. Veer to the right to pick up the obvious ridge that drops steeply to the road and carpark below. Cross the road. From here there are two options. A mild climb straight up the hill above will bring you to the top of Little Baldy. But if you are up for a bit of an adventure, a great option is to drop down into the big valley below you to the west, veering down and slightly right, into a fairly narrow belt of thick regrowth of snowgums (this section is quite slow) then across a steep grassy section towards the base of the rocky ridge in front of you. After leaving the road and descending for 10 or 15 minutes you will find the base of a rocky ridge, go round the bottom of that and you will find a big, open and steep gully above you. The easiest way is just to climb straight up to the saddle on the far sky line above you. But a more exciting option is to start climbing up the gully, and veer into the obvious gully that opens up on the left between two rocky sections of ridge. Climb out at the end of the gully, and veer up and left onto steepish grassy country or else step to the right and scramble up along the steep and quite exposed ridge line. The rock here is ice affected alpine rock, a lot of it is loose – be careful of all holds and watch for people below you, its easy to dislodge rocks. The higher you go the more exposed it is and a fall from the upper section would lead to death or serious injuries. Towards the top the grade eases right back and it turns from a low grade rock climb to a steep walk. You will end up on the rounded summit of little Baldy. Walk to the road, where the car park is. On the other side (south side) you will see the old road, now just a vague rocky track, running parallel to, and perhaps 10 metres below the sealed road. Scramble down to that, then follow the trail, into the next patch of unburnt snowgum. A short time later you will come to a tin hut. Continue along the road for perhaps 150 metres until you get to the start of the trail up Mt Blowhard. Rather than following the trail, strike straight up along the ridge, skirting the belt of trees then on to the exposed summit. Then continue to the far southern high point of the summit ridge, before a very steep descent to the road below where there is another car park (an easier option is to veer left and down to pick up the walking track that will take you to the road). The next climb is up Renee’s Lookout, the obvious hill above you. Head up the obvious open but steep grassy area until you get into the trees, not long before the summit (which is a bit off to the south). On the return from the summit high point, go down the back of the mountain heading north west through the re-growing snowgums until you get back to the tourist road at another obvious carpark (the sign here should say CRB Hills). This is probably the best spot to finish the walk or if you are doing a return trip, turn back from Rene Lookout. You are now past the higher parts of the walk, and the rest is mostly through burnt out and re-growing snow gum. There is an obvious trail out of the car park, which leads over the fairly scrubby CRB hill, although it does become very scrubby with all the snow gum re-growth as you go along. Basically keep following your nose towards the high point of The Twins. The side walk up Mt Smythe (probably an extra 15 minutes each way) is worth it for a good end to the day. The Mt Smythe trail starts and finishes at the car park just near the Wangaratta ski club. See here for details on skiing around the Hotham area. Check here for track notes.